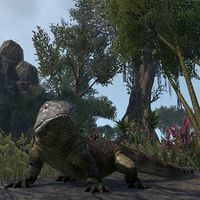 Argonians (Saxhleel, or People of the Root in their native language of Jel) are the reptilian natives of Black Marsh, a vast swampland province in southeastern Tamriel. The other races often refer to them as "lizards" or the "Lizard Folk" instead, especially when meaning to be derogatory. They are known as the foremost experts in guerrilla warfare throughout Tamriel, a reputation brought upon them by defending their borders from enemies for countless centuries. Argonians have a lifespan similar to that of humans. According to the First Era Scholar Brendan the Persistent, "The Argonian people have, throughout Tamrielic history, been perhaps the most misunderstood, vilified, and reviled of all the sentient races. Yet, those who have taken the time to experience Argonian culture have gained a greater appreciation for this noble and beautiful people." However, it should be noted that he himself went missing in his final expedition into the deeper swamps of their homeland. Long ago, Argonians lived in giant stone ziggurats that extended all across Black Marsh and, according to some, even southern Morrowind. These Argonians were capable of great feats, creating magical defenses that remained both functional and effective well into the Second Era. These Argonians both feared and worshiped Sithis, thinking of him only as a force of destruction that required sacrificial rituals to appease. Modern Argonians consider both the construction of the stone Xanmeers and this fearful devotion to Sithis as a result of a flawed belief system, as it only saw Sithis as a destroyer and not a creator as well. Exactly when and how this ancient society collapsed is unknown, but they were already living in established preliterate tribal communities around the time the Aldmer first began exploring Tamriel. The ancient Argonians were quickly and swiftly displaced by the more technologically and magically advanced Elder Folk, and were driven back into the swamps of their homeland. Black Marsh in those times was inhabited by a multitude of races, from the diverse Kothringi tribes to the Cantemiric Velothi (and much later, the Barsaebic Ayleids) to the vulpine Lilmothiit, and they held the Lizard Folk in an almost myth-like sense. For some they were wandering curiosities, for others they were heroes that nobly saved non-reptilian inhabitants from horrors of the marsh, and for others still they were terrifying savages. Argonians only occasionally left their homeland during the early years of the First Era, although there are accounts of certain individuals of the race being found in other parts of Tamriel during that time. According to a Saxhleel ghost encountered in Stonefalls in 2E 582, the ancient Chimer utilized the Lizard Folk as slaves centuries before their descendants the Dunmer would do the same. Exactly when and why the Chimeri practice ended is unknown, but the Dark Elves and even the Saxhleel themselves seemed to have forgotten it ever occurred. The races' standard contempt for outside peoples originated in the latter years of the Alessian Empire, when pirates and other criminals often exploited Black Marsh's treacherous landscape to evade Imperial Law. The entirety of the eastern coastline of the Topal Bay was infamous for piracy, and in 1E 1033 Empress Hestra ordered for the head of "Red Bramman" (the most notorious of these criminals) to be brought to her in order to end the bandit activity. The Imperial Navy were forced to enter Argonia through the Bay and traveled deeper into the swamps than anyone else had before, and finally beheaded the redheaded pirate-king in his bandit kingdom near the modern city of Blackrose. 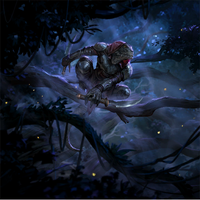 The pillaging and slavery Bramman introduced into the Marsh made Argonians resentful towards the races of men, and their resistance to the continued use of the old pirate routes led to decreased exploration as the First Empire's influence waned. Despite this bitterness, the Argonians still allied with and aided the Empire when the deadly Thrassian Plague ravaged Tamriel in 1E 2200, the first recordable date after the Marukhati Dragon Break. Argonian freebooters joined alongside Redguard corsairs, Colovian galleys, Breton warships, and even Aldmeri cutters in the All Flags Navy – the greatest allied naval force in Tamriel history – to enact revenge against the Sload, a species hated by all the races of Tamriel. The Tamrielics succeeded in their mission, sinking Thras to the bottom of the Sea of Pearls (although it would later rise again), but a great number of their ships were unfortunately pulled into Coldharbour by a magical whirlpool. While the Saxhleel were never conquered by the Alessian Empire, the Reman Dynasty of Emperors on the other hand took great interest in incorporating it as a province during their reign. In 1E 2811 the last army of the Lizard Folk was defeated by the armies of Cyrodiil, but Black Marsh itself continued to lay largely outside of Imperial control. When Reman II ascended to the Ruby Throne, the unconquered territories of Morrowind and Black Marsh weighed heavily on his mind. He rashly decided to conquer Argonia in the year 2830, and nearly lost as many men from the swamps as he did from the Argonians that resisted him. He eventually managed to gain control of the northern and eastern sections of the territory, and declared those parts the Imperial Province of Black Mash in 1E 2837. The Argonians' homeland would go on to become a sort of prison state (specifically the city of Blackrose), a place where criminals not trusted in conventional dungeons could be relocated. After the assassination of Reman III and his only heir Juilek, the Akaviri Potentate declared the beginning of the Second Era. The Argonians saw their chance and forcibly left the crumbling Reman Dynasty, becoming a self-governed territory once again. Unfortunately, after the Argonians left the Empire the Dunmer of Morrowind turned their gaze towards the south and saw a swampy land ripe with potential slaves. Entire tribes were dragged off in chains to Stonefalls, Vvardenfell, and the Deshaan. The Dunmeri Great House Dres was also founded during these times when its progenitor Thalthil Dres conducted a slave-raid on the city of Thorn, and soon became the main source for slaves in their homeland. While the Dark Elves saw the enslavement of the Argonians as a great uplifting and betterment for the race in general, the Lizard Folk themselves detested their newest masters and fought with them constantly. The Argonians are often considered to be the creators of the deadly Knahaten Flu in 2E 560, which originated in the city of Stormhold and then spread throughout Tamriel like wildfire. 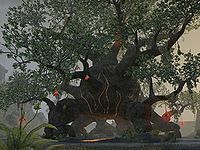 This claim has never been proven, but since the Argonians proved to be immune to the contagion the other races quickly came to believe that one of their shamans manipulated their Hist trees into creating it in retaliation for the constant oppression of their people by the other races (specifically the Dunmer). The Flu soured Tamrielic opinion on Argonians, who were thought to be carriers of the disease, and the Dunmer soon found their most numerous vassals being constantly turned down by others. Perhaps the greatest – and most surprising – historical event the Argonians took part in during the Second Era was the Liberation War (better remembered as the Second Akaviri Invasion). In 2E 572, a strong Akaviri force led by Ada'Soom Dir-Kamal attacked Windhelm in Eastern Skyrim, killing Queen Mabjaarn Flame-Hair and Princess Nurnhilde. Leaving the ruined city behind, the eastern army continued on their way to Riften but found it heavily fortified by the Nords, who were led by Jorunn the Skald-King and Wulfharth the Ash-King (who was called back to Nirn from Sovngarde by the Greybeards). The invaders decided to bypass the Nordic city and entered Morrowind instead, where the Dunmeri army led by Almalexia fought against them but were forced to retreat into Stonefalls (although it is rumored that Mother Morrowind and the Skald-Prince collaborated with one another to set this up despite their races' ancient enmity). With their backs towards the Inner Sea, the Akaviri fought viciously against the combined Nord-Dunmer force, but with the rest of the Akaviri fleet on the horizon it seemed that the Tamrielics would be overrun and slaughtered. Sometime prior to the initial invasion, an Argonian slave girl named Heita-Meen escaped from the Dres plantation she was being forced to work upon alongside several of her compatriots, but was captured by the Dunmer-aligned Archein tribe and taken back to their village. While being held there she received a vision from their Hist tree, one showing the Nords and Dunmer dying at the hands of the Akaviri. She saw an opportunity in this, and when taken back to Thorn she killed her Slavemaster and by way of duel took control of the Archein guards. She headed to Stormhold, where she was able to gain the support of the majority of the Shellbacks there, and then made haste to aid the Dunmer and Nords in Stonefalls. At first the Dark Elves were alarmed to see a force of armed slaves heading towards them; some even attacked the Argonians out of fear. However, the three races were able to get over their mutual hatred and resoundingly drove the invaders into the Sea to drown. In that moment the Ebonheart Pact was born, and would continue to exist all the way up to the Planemeld ten years later in 2E 582. Unlike the other three factions in the Alliance War, the Ebonheart Pact focused largely on wiping away the rashness of Imperial rule as well as ending mortal scheming with higher powers from beyond Nirn. As a show of thanks for the timely intervention of the Argonians, the Dunmer formally ended the enslavement of Lizard Folk (but the practice of enslaving itself did not end). However, some Dunmer (notably House Telvanni) refused to accept these terms and therefore redrew from the Pact. Likewise, many Argonians felt that the Dunmer deserved retribution for their crimes and only the regions of Shadowfen, Thornmarsh, and Murkmire in Black Marsh joined the Ebonheart Pact. Some left their homeland entirely, and settled in other provinces. 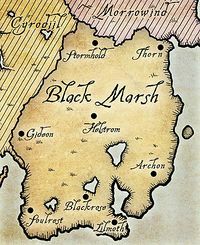 Eventually the Great Moot that ruled over Morrowind, Black Marsh, and Skyrim consolidated their provinces into a single nation. It is unknown what became of the Ebonheart Pact, but by the time of the Tiber Wars it was no longer existent and the Argonians were once again the sole authority in Black Marsh. Saxhleel slavery was also revitalized by the Dunmer at some point, and despite fear of the Knahaten Flu House Dres continued sending slavers into the north of Black Marsh. It is said that even Tiber Septim himself thought twice before attacking Black Marsh in his conquests, and it is implied in A Short History of Morrowind that the Argonian homeland was acquired by treaty instead. Despite this, the borders of their province fell quite easily to his forces and he avoided much loss by neglecting to attack the almost impenetrable inner swamps. The Argonian homeland was assimilated into Tiber's growing Empire sometime after the Second Treaty of Stros M'Kai. During the Third Empire the homeland of the Argonians continued to function mostly as a prison state, and the Emperors were content with holding onto the strategic regions on the coastline instead of annexing the heart of Black Marsh, which remained outside of Imperial governance. In 3E 396, during the Imperial Simulacrum, a slave revolt escalated into the Dunmer instigating the Arnesian War with Black Marsh and taking a significant amount of territory (and undoubtedly many new slaves) when the Argonians lost. Although the enslavement of any civilized race was illegal in the rest of the Empire, the Dark Elves were allowed to continue the practice due to the favorable conditions of the Armistice under which Morrowind joined the Septim Dynasty, which allowed the Dunmer to follow their ancient traditions and maintain great autonomy in their domestic affairs. King Helseth eventually abolished slavery in Morrowind for a wide variety of reasons. With the abolishment of slavery, the Argonians' relationship with the Dunmer vastly improved, although violent attempts to reclaim the lands stolen from them during the Arnesian War continued. While Imperial governors ruled over the coastal cities in the province, many of them had Argonian advisors from the Archein tribe. The Archeins in turn ruled over the rural areas that made up most of Black Marsh. Beyond the reach of the Emperor there was little to no governance in the innermost swamps, and it was unknown if the inhabitants of those areas even recognized Imperial rule. When Mehrunes Dagon attempted to invade Tamriel during the Oblivion Crisis in 3E 433, the Hist trees foresaw his coming and called the majority of Argonians back to defend their homeland. The Argonians were altered by the Hist in order to combat the Daedra, becoming faster, stronger, and able to endure harsher punishment. When the Oblivion Gates were opened in Black Marsh, the Lizard Folk charged into them so viciously that the Daedra themselves were forced to close them in order to avoid being overrun; because of this, the Argonians emerged from the Oblivion Crisis more united and stronger than ever before compared to the other Tamrielic races devastated by Dagon's plot. The Argonians were among the first of the races to secede from the weakening Empire, alongside the Khajiit of Elsweyr. Shortly after the eruption of Red Mountain devastated Vvardenfell, the Thalmor encouraged the Argonians to attack their Dark Elven enemies to the north in what became known as the Argonian Invasion. They had early success in conquering southern Morrowind, sacking many cities (including Mournhold) as they made it as far as Red Mountain. However, the Argonians were eventually repelled by the army of House Redoran, which successfully stopped them from invading the rest of Morrowind. Thankfully, the Thalmor's influence over the Argonians ended with the invasion. Despite their lack of governance or colonization of the southern Dunmeri lands, the Argonians kept the Empire and Morrowind from reclaiming them. Sometime in the early Fourth Era the Lizard Folk came to be governed by a political party known as the An-Xileel, whose views were completely nationalistic. In 4E 43, by invoking the rogue Hist tree of Lilmoth into contacting its 'cousins' the Um-Hist, the An-Xileel were able to summon the floating city of Umbriel from Clavicus Vile's realm in Oblivion in order to exterminate all foreign taint in Black Marsh. The city did this for them, but soon began its own agenda after the An-Xileel lost control over it. Umbriel started on a northwestern path towards White-Gold Tower in the Imperial City, moving through Black Marsh and Morrowind in the process; those slain by the floating city were resurrected as an invincible undead horde to aid the city's dark goal. It was through the efforts of the Breton girl Annaïg Hoïnart, an Argonian named Mere-Glim, Prince Attrebus Mede and the Dunmer mage Sul (along with a few others) that Umbriel was finally destroyed and its threat to Tamriel eliminated. Saxhleel history has remained largely quiet for the rest of the current era. In 4E 150, a small force of Argonian raiders landed on Solstheim to stir up trouble but were repelled by the Redoran of Raven Rock. By 4E 201, a document discussing the government of Skyrim mentioned an Argonian King, bringing up the question of the survival of the An-Xileel after the events of the Umbriel Crisis. A Thieves Guild member also complained about Argonian patrols in southern Morrowind, implying the Lizard Folk have indeed begun some form of governance of those conquered areas. The Argonian allegory known as the Parable of Becoming states that the Hist found the humanoid forms of Men and Mer useful, molding the form of the swamp’s lizards after them to create Argonians. Scholars believe that the Helstrom Ancestor Lizard is what Argonians were uplifted from. Adding to this theory, the Argonian Mere-Glim had a vision while on Umbriel. Within this vision, Mere-Glim experienced the life of a lizard every day until the root and the taste of Hist sap came, transforming both his body and mind. Similarly, theories exist that state that the Hist also mimicked the forms of the mounts of both Men and Mer, for the purpose of being used by Argonians to ride long distances. Argonians believe that their souls were given to them by the Hist – according to the Lizard Folk, there was nothing before the Hist. Because of this the souls of the Saxhleel contain unique qualities that sets them apart from the souls of Men and mer. Most Argonians are able to feel the presence of the Hist in their minds at all times, but the further they travel from Black Marsh the weaker the connection gets. Some Argonians can even be born without this connection, and are viewed by others of their kind as disadvantaged because they can't understand the most simple of Argonian gestures. The Mnemic Egg is a powerful artifact that is the physical manifestation of the Argonian-Hist link, and if severed can prove fatal to both. The Egg came into the interests of the First Aldmeri Dominion, who attempted to sever the link but were thwarted by the Soulless One during the Alliance War. 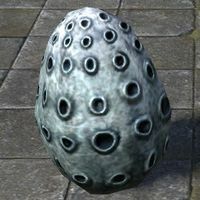 A replica of an egg of the reptilian Argonians of Shadowfen. Although Argonians appear reptilian in nature at first glance, they also exhibit qualities of fish, amphibians, and even birds: they are able to breathe underwater through small gills behind their ears, swim using the same method as that of a tadpole or eel by moving their tail side-to-side to propel through the water, and are capable of growing feathers. Female Argonians additionally have what appear to be mammalian breasts, but at the same time are able to lay eggs. Argonians' genders are sometimes referred to as life-phases. It is said that upon exiting the juvenile stage of life, an Argonian will lick Hist sap in order to stimulate the hormonal glands, which sprout appropriate organs from which the Argonian's gender can be determined. However, this is unconfirmed, and Argonian hatchlings may apparently be of either gender. Argonian appearance ranges from reptilian to almost human; this is caused by the Hist sap they ingest as hatchlings which ceremonially takes place on their Naming Day. Hatchlings are also fed licorice worms. Argonians tickled under the chin will reflexively open their jaws. Ancient cave paintings depict figures which appear to be more tree-like than Argonian. Though the Saxhleel seem to generally be cold blooded, they can apparently regulate their body temperatures just as effectively as their mammalian counterparts. Thanks to this, they can be found wandering the cold environments of Solstheim and Skyrim without any negative repercussions. Some scholars believe this is possible because of the powerful magicks that lie within Hist sap, which the reptilian race ingests throughout their lives. Long ago, the Lizard Folk built and lived in grandiose pyramid structures they referred to as xanmeers and had wayshrines dedicated to the stars. However, these were consequently abandoned for some unknown reason and the Saxhleel themselves can't remember life in those times. During the Second Era the Argonians of Shadowfen lived in huts made from mud, while those in Murkmire constructed settlements out of wood. Because of this alarming change, some scholars doubt that the xanmeers were even built by the Argonians, who in their opinion merely claimed ownership of them. Feathers, bright colors, and lizard hides decorate the majority of their buildings and works of art. Argonians are said to be masters at the crafting of jewelry, which is sought after in many provinces. The Argonians also seemed to be the pioneers in the arts of alchemy, as their alchemists in Black Marsh have long held that the moon phases dictate the precise positioning of calcinators. Jel is the language of the Argonian people, and is unique among the other Tamrielic races by being unrelated to ancient Ehlnofex. It came from the Hist, the creators of the Argonian people. It is even more unique due to the fact that it has no past tense or future tense verbs, only present tense. Aside of the purely verbal way of comunication argonians also do utilize body movements to express their attitude to the speaking subject. For more information, see the lore article. Except for the more deeply assimilated, the Argonians do not formally recognize or worship any type of Tamrielic deity. Some believe that they worship their creators, the Hist, although Argonians themselves state that they only perform rituals in their honor instead of fully worshipping them. The Argonians also revere Sithis, a being that even the Hist acknowledges. The Clutch of Nisswo is a group of priests dedicated to Sithis who wander across Murkmire to collect the 'many truths' of each tribe, and share each tribes beliefs with other tribes. Z'en, the Bosmeri God of Toil, is thought to have originated in Argonian and Akaviri mythologies before being introduced to Valenwood by Kothringi sailors. The Adzi-Kostleel tribe of Argonians believe that the world was created in a struggle between two spirits. Originally, there was Atak, the Great Root. As Atak grew, it's roots "formed new roots, and those roots took names, and they wanted space of their own to grow." Soon, it discovered the serpent spirit, Kota, who had been born from the Nothing and hungered. Atak and Kota fought and ate at each other until they became something new and indistinguishable, Atakota. They shed their skin and Shadow and went to sleep. The Shadow ate the roots and was changed by them, keeping them safe and telling them the secrets before releasing them instead of devouring them, letting itself sleep as well. The secrets changed the roots, making them realize they were now temporary and could change. Many of the spirits learned to fear this change, calling it Death. The chaos that ensued awoke Atakota and split them once more, leading to Atak and Kota and their roots going to war over the existence of Death. Some of the roots drank of Atakota's blood and sap until they grew scales, fangs, and wings. Other roots were protected by a Forest Spirit, singing with her and becoming one with the forest. In the chaos of the war, the Shadow awoke and ate both Atak and Kota, shedding the skin of Atakota and covering all of the roots, promising to keep them safe. The Shadowscales are a longstanding monastic order of Argonian assassins that worship Sithis, the Void, and consists of Saxhleel born underneath the sign of the Shadow. According to some sources the downfall of the ancient Argonians was because their 'scales were darkened' by the touch of Sithis. Shadowscales also serve as a type of law enforcement in Black Marsh, bringing down 'swamp law' on unruly foreigners and natives alike. They are offered at birth to the Dark Brotherhood, a guild of assassins that also follows Sithis, to be trained in stealth and assassination. A lone Shadowscale located in Skyrim stated that their order was no longer a fully functioning group by 4E 201. For more information, see the lore article. Argonians possess the most alien personalities in all of Tamriel from a human or meric perspective and it is often assumed that the Lizard Folk possess neither personality nor emotions. Of course this is not true; Argonians simply do not facially express their emotions as much as man and mer do, though anger is easily detectable from their bared teeth and narrowed eyes. Slow to trust and hard to know, Argonians are fiercely loyal and will fight to the death for those they have named as friends. Their allies have long-since learned that there is always a reason for everything they do. Argonian cultural practices include: wearing socks with pockets containing hot stones on their tails to keep them warm, allowing birds to pick their teeth clean after a meal, and filling their pillows with live centipedes for the pleasant wriggling sensation. Something remarkable about the Argonian people is that their culture seems to exhibit a forgetfulness regarding the actions between tribes. For the Argonians, hating each other is to hate themselves because they are all people of the root. Therefore, it is "better to forget and move on". Because of this, the Saxhleel, like the Bosmer, prefer to live in the Aurbical Now – not dwelling on the past or the future, but simply the present. Adzi-Kostleel: The tribe of Murkmire that's claimed to be the bearer of an oral tradition of the Argonian creation myth, collected by researcher Solis Aduro. Agacephs: Most have needle-like faces and vary in color from bright green to orange. Found in inner Argonia near the Hist. Archeins: During the time when other races tried to put plantations in Black Marsh, Archeins were very powerful and made fortunes by selling other Argonians into slavery (at the expense of being branded as traitors). They also served as the advisors of Imperial governors in Black Marsh, and were in charge of the more rural districts as well. Since other races have realized that Argonia is unfit for plantations, they have gone bankrupt. Copper-Eyes: A tribe native to Murkmire, they fell victim to the depredations from those of Mazzatun. Gee-Rusleel or Miredancers: An introspective and pious tribe. They have a deep connection to the Hist, naming a "Sap-Speaker" who is said to work as a direct intermediary between the Hist and the Argonian people. They are also obsessed with games and inveterate gamblers. Kota-Vimleel or Black-Tongues: A tribe native to Murkmire. They are accomplished Alchemists and ardent Sithis worshippers, able to modify the hatching time of their eggs so that most hatch under the sign of the Shadow, providing a large amount of Shadowscales. Naga-Kur or Dead-Water: Described as having "huge mouths filled with dripping needle-like fangs". They are usually seven to eight feet tall. The majority of the native brigands and highwaymen are tribeless Naga. Paatru: Described as "toad-like", they live in the inner part of Argonia. Tum-Taleel or Root-House People: A tribe native to Murkmire. They do not create anything on their own, relying solely on other tribes to provide for their needs. This even applies to residence, leading them to often raze entire towns for themselves. They destroy what they do not need any more, to keep the other tribes creating things. Sarpa: Described as being "winged", though it's unclear if this is meant literally or not. They live in the interior of Black Marsh. Su-Zahleel: The peaceful tribe of Shadowfen that have been abducted and pressed into slavery by the warrior fanatic tribe of Xit-Xaht that have been driven mad by their psychotic Hist. Veeskhleel-Tzel or Ghost People: A tribe native to Murkmire. They feature pale white scales and are known to steal the dead of other tribes and perform necromantic rituals on them. They are unable to lay eggs themselves, and are forced to steal them from other tribes, as well. Wasseek-haleel or Bright-Throats: A tribe native to Murkmire. Their tribe is composed of cheerful artisans who have enjoyed a fruitful relationship with both outsiders and deep-swamp Argonians. The Bright-Throats are famous for their rich music and dance tradition, as well as their preternatural talent as woodcarvers. Xit-Xaht: Tribe of warrior fanatics that have been driven mad by their psychotic Hist in Shadowfen. For Argonian names, see here. For more information regarding ancient Argonian society, see here. ^ Empty Nest quest in Murkmire. This page was last modified on 25 February 2019, at 08:27.